After 3dtotal published all those wonderful sketchbooks from the Sketching From the Imagination series, I started to wonder when they are going to have a book that teaches sketching. Well, here's that book. 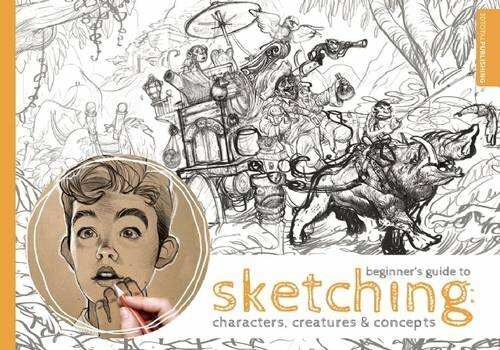 This is an instructional book on sketching with 10 contributing artists. I like that they have used matte instead of glossy paper. There are 206 pages. The content is split into four main parts, namely Getting Started, Sketching in Color, Quick Tips and Drawing Projects. The first section provides information on the tools and has some simple drawing lessons to get you warmed up. The section section on colour sketching is rather too brief. Third section with the quick tips is fantastic. It teaches drawing techniques for specific subjects, such as gesture drawing, hair, hands, textures, etc. Last section of drawing projects takes up half the book. There are several projects by different artists. These are step-by-step tutorials that go through the drawing process from start to finish. It's easy to follow along as they all start with simple layout sketches before the details are slowly added with each step. The subjects are all have some fantasy element, such as drawing creatures, characters and concepts. Medium of choice in the book is the pencil, which is the most versatile drawing tool. The examples throughout the book look good and inspiring. This is a wonderful and accessible book for anyone learning to sketch.